If I were Robert Mueller, I might be sleeping a bit fitfully for an undetermined period of time. Mueller, the special counsel appointed to examine allegations of collusion by Donald Trump’s presidential campaign with Russians seeking to influence the 2016 election, now suddenly seems a bit more vulnerable to White House trickery. Rachel Brand, the No. 3 in command at the Department of Justice, has quit to become general counsel for Walmart. Brand had held her job at DOJ for less than a year. This is a real big deal. Here’s why. The president can’t stand Attorney General Jeff Sessions, who recused himself from anything dealing with Russia. Sessions had worked on the Trump campaign foreign policy team and on its transition to the presidency. He was too close to the Russia matter to be an independent investigator. So, he stepped aside. 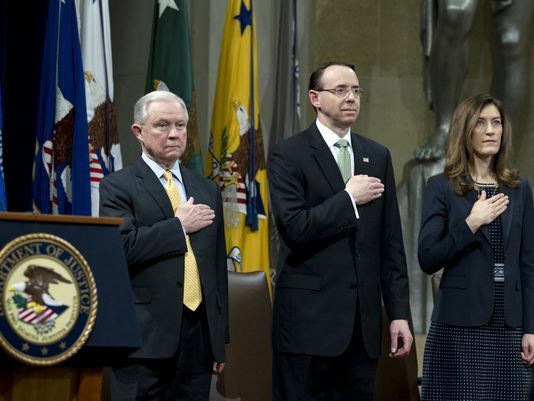 It angered the president so much that he has said that had he known Sessions would recuse himself, he would have nominated someone else to become AG. Now we have Rod Rosenstein, the No. 2 at DOJ. Rosenstein selected Mueller — a former FBI director and a crack lawyer himself — to be the special counsel. Mueller has assembled a first-rate team of legal eagles to investigate the “Russia thing” that caused Trump to fire James Comey as FBI director. Rosenstein has the authority to fire Mueller if directed by the president, but he has said he won’t do so “without cause.” Trump hasn’t exactly issued a vote of confidence for the job Rosenstein is doing as the second banana at Justice. OK, now for the punch line. Trump can select whoever he wants to succeed Brand. The new No. 3 must go through a Senate confirmation process. If the president were to dismiss Rosenstein, that means the next in command would be available to dismiss Mueller if the president issues the order. My operative question, thus, goes like this: Is the president going to ask Rachel Brand’s potential successor if he or she is willing to fire Mueller if the order comes from the White House? Sessions is now out of the game, more or less. Rosenstein says he won’t fire Mueller simply because the president wants him gone. That means, the way I see it, that Sessions and Rosenstein now are vulnerable to the Machiavellian whims of the guy who sits behind that big desk in the Oval Office. Trump could axe both the AG and his chief deputy, leaving the next in line — the third in command — to do the dirty work of getting rid of Robert Mueller, which then could derail the special counsel’s work of finding the whole truth behind the collusion matter. I believe that would smell like, oh, obstruction of justice.